Just like any kid of the 90’s, I grew up in front of the television. I still think that we had awesome cartoon back then unlike today but that’s just me. 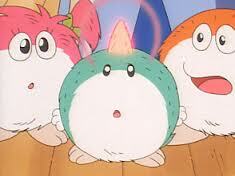 It’s a cute story that features 3 cute and very round characters. They’re actually siblings named Mojacko, Mojari, and Mojari. They would always say “Moja, Moja” and the villains name is Momonja who says “Mon, Mon”. These characters from another planet comes to earth and befriends Sorao and Miki. I loved Johnny Bravo to the point of buying merch like shirts. Now looking back, I don’t think he was a great role model for young boys to watch. He was actually a womanizer, right? But i guess, it works. I for one was hooked watching him make a fool of himself. I don’t know, I guess the charms of this “handsome”, macho, airhead worked on me as a kid. Although, he did love his mama so I tuned in every morning and watched him chase after girls, be superficial, and just be Johnny Bravo. 4. The Little Lulu Show. “Little lulu, little lulu, with freckles on your skin. Always in and out of trouble, but mostly always in…” Hahaha! I still know some of the words in the theme song! Oooh. I love this cartoon. Not all the kids liked it but I did. It’s smart and funny. It showed Lulu as a stand up comic talking about her adventures with Tubby Thompkins. This is a tagalized cartoon about the adventures of Tom Sawyer and his best friend Huck Finn. My favorite episode would have to be the one where Huck Finn got sick and Tom made him drink Castor Oil which only made him more sick because it was an ointment not a syrup medicine that you swallow. 🙂 This cartoon series was one of the must watch during my childhood. It was basically part of my morning ritual before going to afternoon classes.